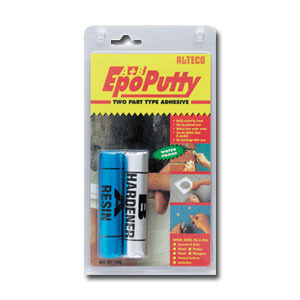 Epo Putty is a clay type two parts epoxy putty adhesive. Totally Reef Safe, Developed for use on concrete, fibreglass, metal, PVC, plastic, wood, etc, it can be applied on dry or wet surfaces and cures even under water. Epo Putty Product Epo Putty doesnt shrink after cure, it can be drilled, grinded, filed and painted after it has cured. It is also resistant to chemicals and fungi. Epo Putty is the new kid on the block of Aquarium Aquascaping. Whether you are bonding Live Rock together or fastening corals to rock in your tank Epo Putty is for you!